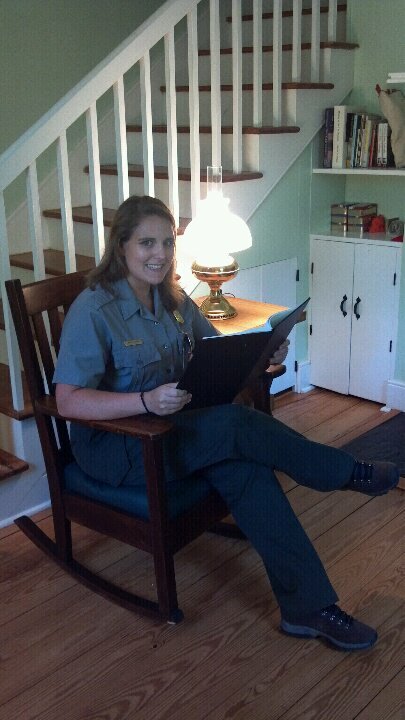 Reading my master’s thesis in Lockhouse 10. The interpretation for this Canal Quarters building is based on my research. I was an integral member of an interdisciplinary team that created the C&O Canal Quarters Program. The program opened historic lockhouses at C&O Canal National Historical Park to the public to stay in overnight for a unique interpretive experience. During the pilot phase of the program, the NPS undertook preservation maintenance on five historic lockhouses and developed interpretation for each building. It established a partnership with C&O Canal Trust to furnish the buildings, administer the registration system, and manage volunteers. I worked on virtually all aspects of the pilot program, including writing the cooperative agreement between the Trust and NPS, monitoring the preservation of the historic buildings, developing the interpretation, creating registration and visitor use policies, establishing a volunteer corps, updating management on project progress, and initiating the program’s Environmental Assessment. Skills Utilized/Acquired: Cooperative agreements, partnerships, non-profit organizations, managing volunteers, project management, historic preservation, interpretation, heritage tourism, and Section 106/NEPA compliance.